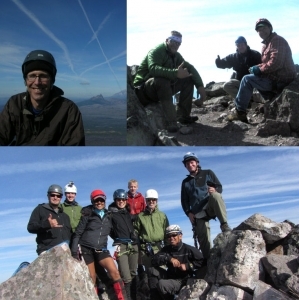 This one was a big project: myself plus twelve climbers, almost none of whom had done this mountain before. I originally intended to limit it to 10 - even that is big team for this mountain, but after such a dull summer, much of which I couldn't climb at all due to my foot still being in recovery from a bad break the year before, everybody wanted to go. So, to manage all that, I had us split into three groups. My group could go up first and set up all the ropes and protection, we could bring each of the other groups up and down on the summit block, and pack out. It came pretty close to working, too. Each group was divided so that they had one club member for a leader, and at least one GPS for guidance, with a GPS track that I had made available beforehand, since the ridge-tailings can be tricky on that route. It's not bad if you have a sense of the route, but there is little visibility of the mountain or the intended ridge, so it can make for a lot of muddling around. The first group turned out to be myself, Gabe, Nate, Tyler, and Tim, departing the PCT trailhead at 6:30. The next group was Peter, Jenny, Nathan, and Humaira, departing a couple hours later. And finally, Steven, Adrian, Craig, and Neil got to make a leisurely late-morning start. My group reached the saddle about noon and starting setting up the ropes. We were hoping to have tagged the summit and be ready to belay the next group up, but they ascended a little faster than we did and caught up with us when my climbers were on the last pitch before the summit. We set up three ropes for protection. The first, of course, on the long treacherous pitch just above the saddle. From there, I set a fixed line tied at both ends, winding around to the left, up, and around to the right. I put a few loops in the rope in the tricky bits, so that if the climbers were nervous they could clip into them and limit their exposure. None of the small pitches on that fixed line were all that dangerous, it was just a matter of keeping one from losing control and falling right off the mountain. The third rope was used for the top pitch, and also for a tricky bit right below that, although the rope wasn't quite long enough to do both at the same time, so I was constantly repurposing it, or at least a part of it. A fourth rope would have really made it all work out. So we were working the summit block from about noon until after 4pm. Most of us ended up on the summit together, excepting a few of my original group who had got bored and headed out. The summit was beautiful. It was a gorgeous and clear day, with just a little breeze. We got a really good look at the Pole Creek Fire burning over north of the Sisters, which I'm sure we will be taking a closer look at in future climbing seasons. There was only one other group up there that day, two men and two small girls who were climbing without helmets and with almost no protection. I tried to help them, but they refused help and kept doing stupid things, like climbing across our ropes on exposed pitches when we had a climber on. We just tried to stay out of their fall lines. At one point I felt I just had to say something, so I told one of them that from our perspective, what they were doing was dangerous to the point of being foolish. He didn't really say anything, but I hope he gave it a good thought in reflection. The other main hazard of that summit block, even with all the protection, is falling rocks, usually kicked by other climbers. I had warned everybody to be delicate when placing your feet, and to check holds carefully, and all our teams did an awesome job. The only significant rock that fell was caused by me pulling a rope down. Then we all rapped out, tore down, and rushed off the mountain, as usual staying just ahead of the falling sun, trying to get down the scree field to the flat land before dark, and just barely making it in the twilight. I found probably the best route I've taken on that descent, heading as far to the west (left, around the mountain) as possible, along the sides of the ridges. The rock offered some good holds, and this route kept out of everyone's fall lines. The top part of that descent is always tricky, slippery, and scary, and I would highly recommend the route that I took. At the far west, it joins the scree trail that traverses the field in a gentle slope back across to the north. We hiked out under headlamps, most of the crew all together. We had some trouble finding the trail, and had to do a bit of bushwhacking along the side of the ridge, but we stayed pretty high to avoid underbrush and eventually found the ridge trail, descending it back to the PCT at the cairn. A couple more hours' trudging, and we were all back to the cars by about 9:30. Another great SAC adventure! Instructions for uploading photos: here. Unfortunately I didnt get many photoa from this trip and would love if anyone had any of me to maybe upload a few or send em to me via email... thanks guys! Hope to see you all out there again! Hey Gabe, I had a couple of you ... I used Fritz's uploader last night, but I'm thinking they hang out in purgatory for Fritz to approve them prior to showing up in the gallery. I had a bunch of you, too, Gabe. I think I sent them to the SAC uploader. I'll check with Fritz. Gabe, I have some great photos of you. Hopefully, I'll figure the SAC uploader out. WOW! great Gallery of pictures! thanks. too many, i know! btw, to download any photo, go to the 'Actions' menu above the photo, 'View all sizes,' select size for download, then right-click to save image. Really, really, really freakin' awesome. Thank you for taking so many since I forgot my camera! Had such a great time with y'all and Thank You so much again to Fritz for taking his time and skill to give us all the experience of a lifetime! ROCK ON!!! Trip report posted finally! Anybody got anything to add?